Believe it or not, but the conventional forms of storing data have surely become obsolete now. A big thanks to cloud storage technology, our data now remains stored at much more secure locations and is available anywhere, anytime. We don’t have to worry about hard disk crashing issues neither the storage size anymore. Saving data on cloud locations let us have a peace of mind, isn’t it? Dropbox is the first name that strikes our mind when talking of cloud storage services. It is an amazing go to service for cloud storage and file syncing. At any point of time if you decide to share your PC with your friends or family members you can use multiple Dropbox accounts on your system so that your data remains safe at separate locations. Or if you have maintained two separate accounts to keep your personal and professional lives apart, it can work wonders in that case as well. 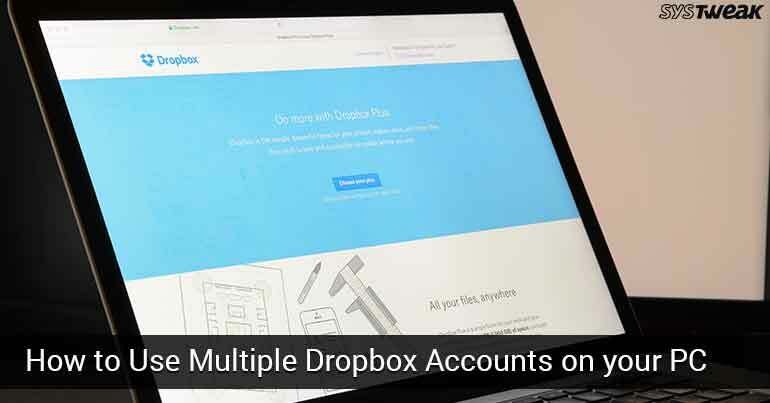 Here are a few options to use multiple Dropbox accounts on your Windows PC. This is the simplest way of using multiple Dropbox accounts on your system. For this you can use your primary Dropbox account on your desktop like you usually do. To access your secondary account, launch any web browser and then switch to incognito mode. Now visit Dropbox’s official website and sign in with your second account credentials. In this way you can get access to both your accounts at the same time. The Dropbox website will give you access to all your data and files along with adding new folder capabilities as well. Visit Dropbox’s official website and login to your secondary account. Now tap on “New Shared folder”. Pick any one from “I’d like to create and share a new folder” or “I’d like to share an existing folder for their respective functions. Select the folder with the contents you want to share, then tap on “Next” to proceed. Now input your primary account’s email address to grant access. Don’t forget to tap on “Can Edit” button. Once you’re done, tap on “Share”. An email will be sent to your primary email address, open the email and then tap on “Go to folder” to confirm activation. In this way you can access shared folders and use both your accounts at the same time. While using any of the above two methods, you might face a lot of Dropbox account restrictions. So, if you don’t want any kind of hindrance while working, here is the last resort for using multiple Dropbox accounts on your Windows PC. Create a second Windows login account, suppose you name it “Test Account”. First, login to your primary account and then press the Windows+L key to switch accounts. Now login to your second windows account. From the secondary account, download and install the Dropbox Windows program. Now lock your secondary account and switch back to primary windows account using Windows+L key combination. Once you arrive in your primary account, open Windows Explorer program and navigate to Users folder and open “Test Account” folder. Hit the “Continue” button to grant permissions. Navigate to the Dropbox folder in the secondary account’s User folder. Here you can access all the data from your secondary Dropbox account through your primary Windows account. For a quick access, right click the Dropbox folder and create a desktop shortcut for the same. So folks, here were the 3 ways to access multiple Dropbox accounts from your Windows PC. For any other queries feel free to hit the comment box!